The Shamanic Healing Oracle was created by Michelle A. Motuzas and published through Schiffer publishing. Motuzas intended for this deck to stir our deepest intuition and help us face all that might be hindering or assisting us in our healing journey. I’ve grown so picky about oracle decks that it’s been sometime before an oracle deck called to me. The Shamanic Oracle was an immediate connection, with its stirring cave-painting style art. It arrives in a two part glossy box that is sturdy enough for one to keep their deck in without much worry. The cards are pretty standard size if just a bit wider and are as glossy as the box. I despaired about this a bit because I think this deck would be even more beautiful with a matte finish. Most people will enjoy the gold gilding on the edges of the cards. Personally, I could take it or leave it, especially because gilded images often means glossy cards. There are 44 cards covering a variety of topics and what I do enjoy most is the little booklet that comes with the deck- also it fits right into the box so I don’t have to be concerned about storage. 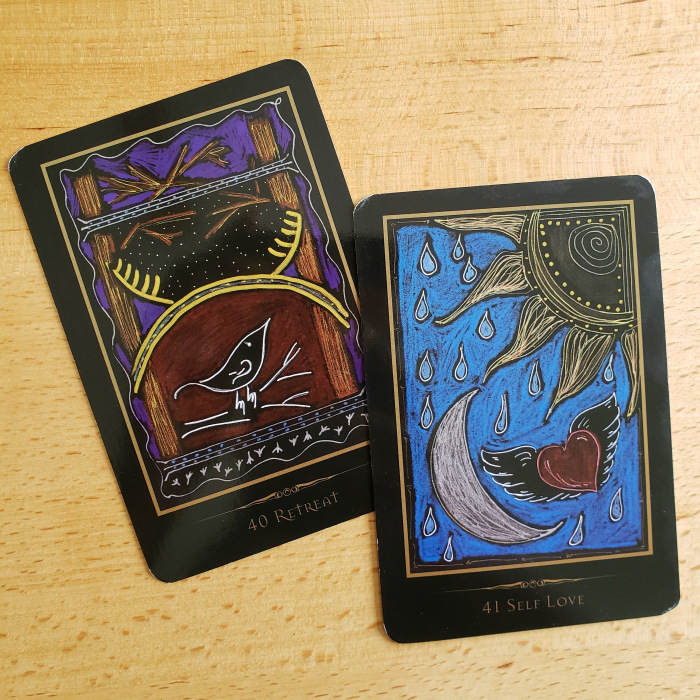 As I looked closer and explored the deck, I felt connected to the images and the messages lying within them. Many of the symbols are easy to recognize and are pretty universal. I’m charmed by the painting style and rivited with Motuzas’ use of color and shading in the deck’s art that creates immediate connections to my intuition. This is my kind of oracle deck, one that skips over the more common light and airy and soft oracle card tradition and dives in deeper. The fact that the backgrounds are colored black makes me feel as if I’m sinking deeper and deeper into a cave and when the light appears, so do these images. Yet another deck using what would be considered “simple” styles to create complex messages. Okay, so the word “shamanic”. Unfortunately, shaman and its derivatives have become overused and misused and often connected with wholesale appropriation of cultures. So now when we see or hear the word, images of exotified and terrifying figures from cultures that have been violently robbed of those very cultures come up. Everybody and their mother is calling themselves a shaman, like how everyone refers to themselves as a priestess but with this dark undertone of racial violence. Folks have used the word to justify appropriation and co-opting of practices they barely understand. Personally, I take its meaning to refer to the teaching and healing elders we learn from and ourselves as we teach and heal ourselves and become our own future ancestors. One cannot simply become a shaman, a journey must first be began to gain connection with our deepest self, and thus the universe. And you don’t even have to style yourself Shaman! Every culture on this planet has a word for the healer, the teacher, the elder turned to. It is worth exploring what the names of peole who did this work are in our own cultures before defaulting to generalization with umbrella words like shaman. 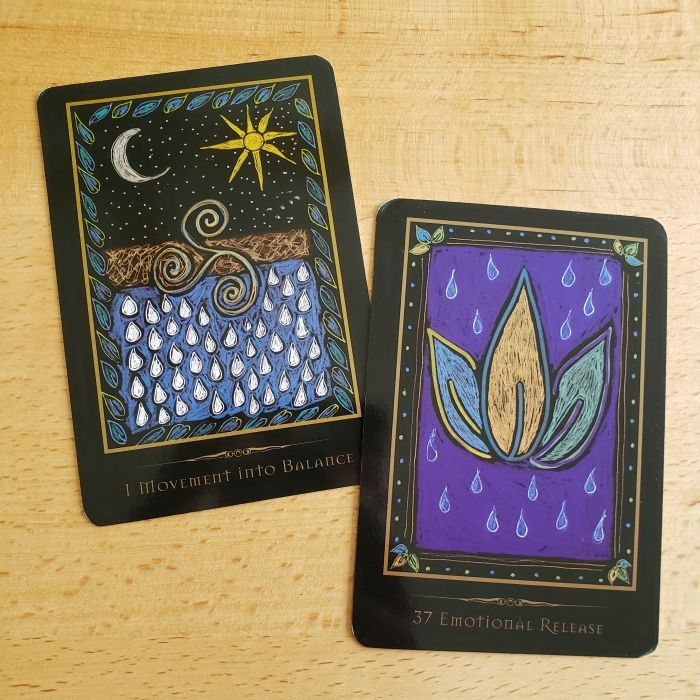 The deck also had cards of masculine and feminine, a dichotomy that I’m slowly and steadily growing out of (which isn’t to say I’m done practicing the feminine as power, it just feels so shallow to constrict energy into masculine and feminine all the time. In fact, when I first started using the deck, I took these cards out and put them away. This would be a great deck for meditation, altars, and I think it would shine when used as a writing prompt. The universality of the symbols in the art makes it accessible to both the beginner reader and the more experienced cardslinger. You can purchase a copy for yourself at Schiffer Publishing at $24.99 and on Amazon where it’s often on sale.